You can spend a lot of money buying Hallmark cards… possibly as much as $100 per year, or more. For instance, if you typically spend $4 per card and you purchase 25 cards per year for birthdays, anniversaries, weddings, and other occasions — that’s $100 per year you’re spending on something that will most likely just be thrown out after it’s received. Instead of having that money go straight into the trash can, save yourself a nice chunk of change by making your own homemade cards. Not only is it a fun way to exercise your creativity, it also will often be a lot more meaningful. 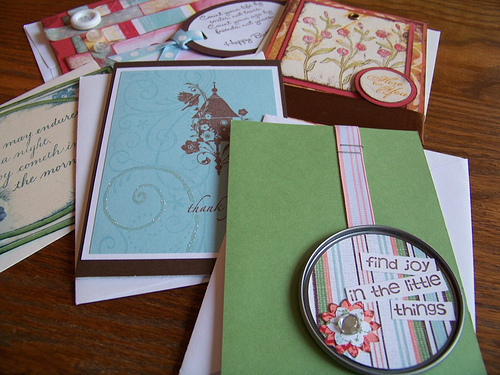 There are so many different ways to make your own homemade cards. 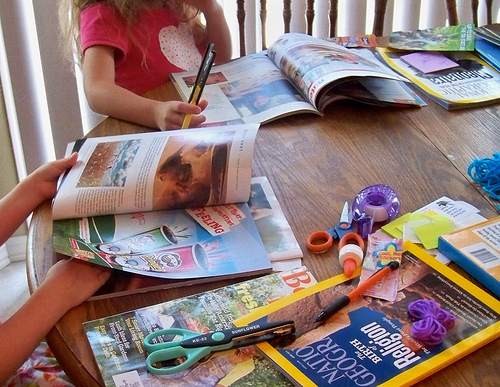 If you have some magazines, cardstock, and glue, you can get creative making collage cards with cut-out words, phrases, and pictures that remind you of the card’s recipient. has some fantastic ideas for into new Christmas cards for this year. You could use this same idea for cards for other occasions, too. 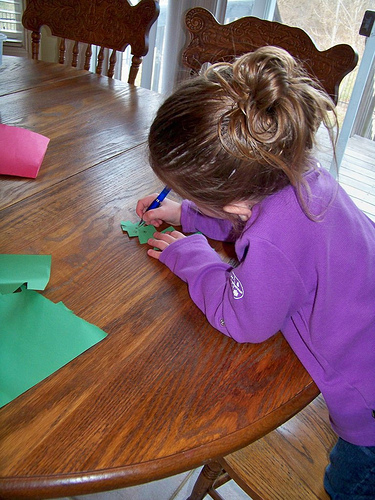 It doesn’t have to cost a lot of money or take a lot of time to make a homemade card. You probably have supplies on hand that could work. However, if you want to, you can come up some , too. Not Crafty? Write a Letter Instead! Maybe you feel like you’re not crafty and creative at all. Never fear! You don’t have to pull out the glue gun and glitter. Write a meaningful letter, instead! I don’t remember the exact Mother’s day. I don’t remember even why I picked that Mother’s day to give this gift, but I have been forever touched by it’s impact. That year I grabbed a dollar store card, and in it, I placed a simple list written on plain paper. Little did I realize how much my mother would cherish that list. Perhaps if I did, I would have chosen nicer paper. Perhaps I would have used my best handwriting, but then again, I doubt that would have changed the cord it struck in my mother’s heart. On the list, written with the ink of a inexpensive dollar store pen, were 10 things my mom held dear. What were those 10 things? What was that list? Why did it touch my mother’s heart so? The title read “10 Reasons Why I am Glad You Are My Mother”. Each point I thought about, some were simple “I love your habit of backwards dinners” some were more deep “thanks for providing the best you could for me with what you had”. Never was a thank you said, never was the list even mentioned until one year when my mom knew her time on earth was coming to an end. She said, “honey, the best Mother’s day gift you ever gave me was that list. In fact, I still have it an read it often”. Words (not things) have lasting power. Do you have any quick, easy, and inexpensive homemade card ideas? I’d love to hear about them — and feel free to share links to your blog post(s) or other ideas online, too! Thanks for this post! I enjoy making homemade cards and find that it saves me not only money, but also time. For me at least, it’s really does take a lot of time to put “purchase card” on a to-do list or shopping list, get to the store, pick out the perfect one from among all the options, make sure I don’t crunch it in the bag on the way home, and finally sit down and write it out and put it in the mail! It’s easier for me to pull out my craft supplies. “It doesn’t have to be very fancy to be beautiful and heartfelt.” — I so agree! I need to downsize and would be happy to send Elizabeth some of my supplies. Let me know what can be done. Me too! I have some scrapbooking supplies I’d be happy to pass on to Elizabeth.. I often take junk mail sent in the mail, process the mail into small pieces, add twice the amount of water as paper, press between cellophane sheets, and tin plates I had made at Lowe’s, air dry, and make card from it. They look like the paper in fancy shops, and through trial and error, I made mine just as cute! I have been handmaking all my cards for years now, and have even made mass designs for occasions like my wedding and baby shower! After becoming a mom, I discovered that my parents and my husband like cards that are decorated by my son or with pictures of my son (for when those great deals for free picture cards–shipped deals come about). My dad still has a Father’s Day card with a picture of my son from a couple of years ago, still posted on the fridge. Love the picture of the kids all making cards together. I often have my daughter make our Christmas cards. Oh and thanks for including my post. Wow, I was so thrilled and surprised to see the pic of my friend’s cards here today! Neat! Ironically, our church just started a prayer/card ministry and I attended the first meeting today and we filled out cards for people and prayed for them. I had forgotten about the juice-can-lid cards and we were talking about creative ideas for cards for our ministry. I’m going to have to use this post for inspiration…again! Thanks Crystal! I was just looking at that post with the pictures of when we got together and it made me miss you and wish we could see each other again! I love doing DIY projects to save money. So much fun. Great idea to make cards. I also like to use my printer to make personalized cards that look like I spent lots of money on them. Homemade cards are really great. However if you’re short on time, Walmart sells the Value Hallmark cards. These cards are $0.49 or a $1 and look really nice. Dollar stores are also great places to find inexpensive cards. Party City also sells their cards for a dollar. After discovering Walmart’s dollar cards, I don’t pay more than a dollar for cards (unless I really, really, really like the card and have a specific person the card would be perfect for). We send cards to all of our parents, grandparents, siblings, nieces, nephews, cousins, aunts and uncles. We have a big family so it is quite a lot of cards but I don’t see a lot of these family members. It’s my way of staying in touch with them. And I figure my relatives are worth more than $2 (the cost of the card the stamp). I get all my cards for free at the drugstores and Target. Stock up after the holidays for next year! I cut cards and designs to add to them from gift boxes, gift bags (especially those that have been ripped or wrinkled and don’t look nice enough to reuse as gift bags), and greeting cards that my family receives. Also, the “recycling last year’s Christmas cards” link in this post doesn’t work. Although not exactly a money-saving option per se, another idea along these lines — when attending a baby shower, spend the money you would have used for a card on a children’s book. Inscribe the book with a personal message & include it with your gift in lieu of a card. That way, instead of just tossing the card after reading it, the mom-to-be has a book she can save & share with her child, complete with an inscription from whoever gave it to her. I have seen this done at several baby showers & the moms love it! I like hand-making cards, and I encourage my kids to do it, but I just don’t have the energy for it at this stage of life. (Kindergartener, 3-year-old, another on the way). So, my husband and I were pretty thrilled to discover Treat.com. You can make personalized cards for the same price as a Hallmark card or less – it’s been great to give meaningful, personalized cards for birthdays, etc. this year for $2.50 each (you can pay even less if you buy a large “subscription” up front). They’ll even send them for you for the price of a stamp, if you don’t mind not being able to sign it. Not trying to sound like an advertisement, but we’re really happy with them – the only problem is that you need to make your cards at least 3-4 days before the occasion you need them!